This four column press has a tonnage of 50 ton and is built with four chrome-plated cylindrical columns to ensure perfect paralellism of the upper table. This type hydraulic press has a table size of 970 x 620 mm, a vertical light of 600 mm a piston stroke of 450 mm, which can be easily regulated. These four column presses are equipped with a two-speed hydraulic unit with an automatic disconnection of the high speed and can be operated manually or semi-automatically. The presses include a pressure regulator, a manometer in tons and are operated by electric pedals. 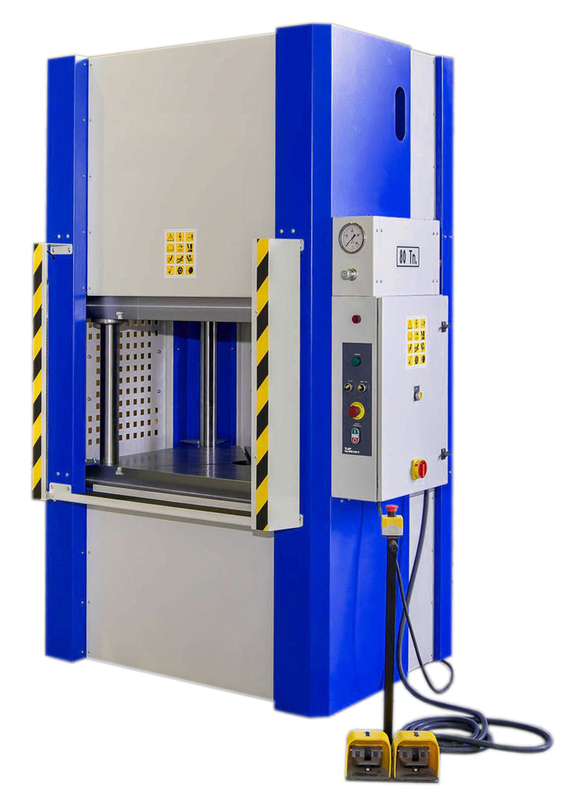 All our hydraulic presses comply with CE regulations and work with a hydraulic pressure lower than 320 bar to guarantee a greater durability of the presses. These four column presses are made in Europe and RHTC can guarantee a high quality of these machines. Therefore, these hydraulic presses with four cylindrical columns have a warranty of 2 years.